Data newly released by the Organisation for Economic Cooperation and Development (OECD) reveals that Australia is not matching other industrialised countries in investing in medicines to treat disease. 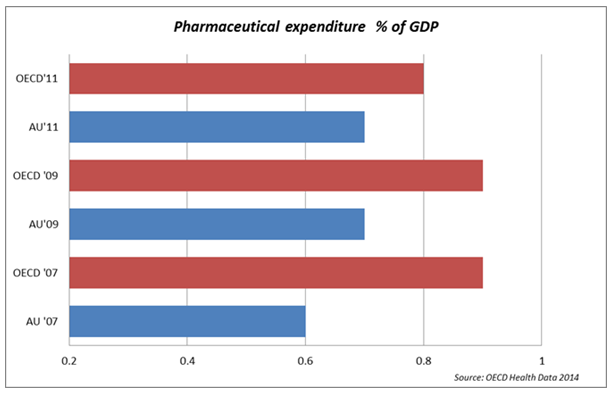 The new OECD Health Data 2014 report shows that Australia’s public spending on pharmaceuticals is at 0.7 per cent of GDP, compared with the OECD average of 0.8 per cent, on the most recently available international data. Medicines Australia Chief Executive, Dr Brendan Shaw, said these figures are very worrying. “Australia is investing proportionately less of its income on new treatments for things like cancer, diabetes, rare diseases and cardiovascular disease than many other OECD countries,” Dr Shaw said. “The OECD data shows that Australia has consistently committed lower levels of public spending on medicines than the OECD average for many years. “These OECD figures don’t even take into account the massive price reductions and billions of dollars in savings delivered in Australia over the last 12 to 18 months through price disclosure reforms. “We’ve seen from the latest Federal Budget figures that public spending on medicines as a proportion of GDP has fallen even further, to 0.6 per cent last year. “While some critics lament Australia’s spending on medicines, the fact is we spend much less compared to many industrialised countries. We are underperforming, and will continue to lag behind countries such as Germany, Japan, and even Greece. “Without action, it’s likely that Australia will fall further behind the OECD average in coming years.